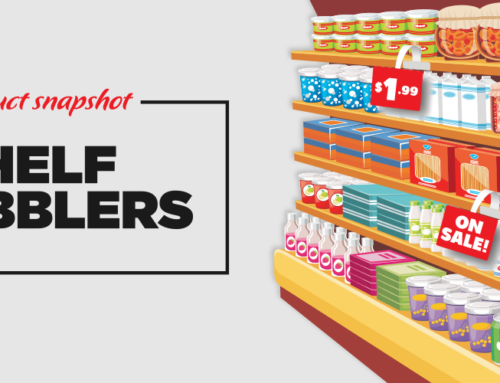 Standard convenience store or party store shelf units usually feature tracking along the front where you can insert shelf strips to advertise product pricing and information. 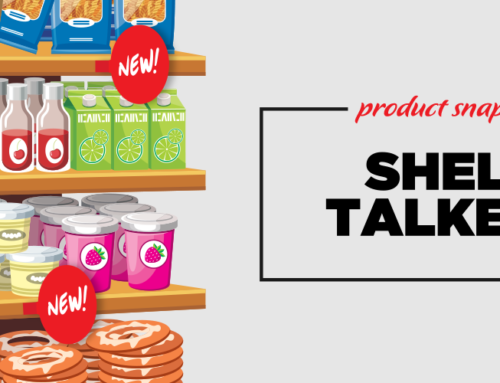 At Wilde Signs we know that this is a great place to leverage product sales and promotions, and we take that one step further by offering custom die-cut Shelf Strips that offer a fresh new way to attract the eyes of passing customers. With die-cut Shelf Strips portions of the sign stick out from the tracking and offer a larger area to showcase product images or pricing. Read on to learn more about how you can utilize this effective product advertising sign solution at your place of business. Shelf Strips are digitally printed directly to a plastic based material called styrene for a durable yet low-cost sign option. They slide into standard shelf tracking that can be found at most gas stations, convenience stores, grocery stores and party stores. The most common shelves feature tracking that is 1.25″ high with a length of anywhere from 4 to 8 feet. Shelf Strips fill the horizontal space on the front of each shelf, and can be utilized in conjunction with other shelf signs including shelf wobblers and shelf talkers. These sign solutions combine to create a visually pleasing way to draw customers to your current sales & promotions. While standard rectangle Shelf Strips can look great, one creative angle we love to add is die-cut products or text. These elements stick out either above or below the tracking. Adding die-cut sections gives you the ability to add larger images or text, creating a better advertising opportunity than standard rectangle Shelf Strips. Custom shapes matching the products advertised can add a very appealing and professional look to the shelves that will most certainly help draw the attention of passing customers. Shelf Strips can be cut to any length so that they sit directly under the product they are advertising. They can also be designed to be short, repeatable sections that overlap each other, giving you better control of their final length. This comes in handy if you plan to reuse them, or if the amount of product on your shelf frequently changes. Shelf Strips are a great way to advertise product sales or promotions near the actual products. With advertising space being limited inside most convenience stores if you are not already taking advantage of shelf strips and other temporary in-store signs like Shelf Talkers and Shelf Wobblers you are missing out on great ways to advertise: current sales, promotions, rewards, new products etc. AWESOME IDEA Consistently use specific sign colors for things like: product sales, product types, rewards earned with purchase etc. By using colors to differentiate, your regular customers will begin to make the connections and be even more aware of them and their meaning! AWESOME IDEA Consistently use specific sign colors for things like: product sales, product types, rewards earned with purchase etc. By using colors to differentiate, your regular customers will begin to make the connections and be even more aware of them and their meaning! If you are not currently utilizing a variety of indoor and outdoor signs at your retail store, you are not setting your business up for success. Strategically placed, high quality signs can have a huge impact on increasing the dollar amount a customer might spend. We would love to set you up with a retail sign & marketing specialist who can help you find the right sign solutions for your budget and needs. Contact us today so that you can increase revenue tomorrow.